It's About Knitting and Other Stuff...: (Sort of) copy of People Tree Skirt - Pt 2, the curse of the buttonholes. (Sort of) copy of People Tree Skirt - Pt 2, the curse of the buttonholes. By the end of part one I had cut out my four skirt panels and was just about to embark on an epic weekend of belated birthday cake making, sandwich and things on sticks construction, and a party for 10 (count 'em) five year olds on the Sunday. 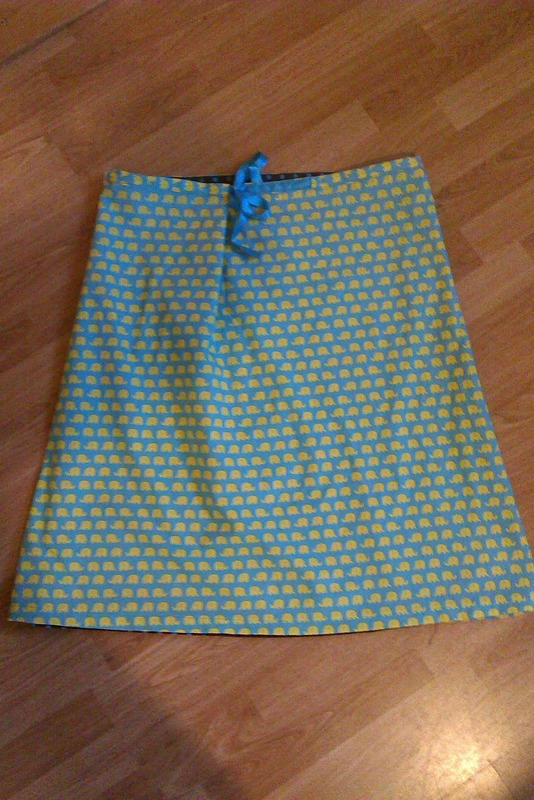 I took the Monday off which meant I had time to sew some of the skirt together (and fall asleep in the chair at 4pm). I dug out the pieces from where I'd hidden them from sticky fingers - pressed them again, there is a lot of pressing - then started the sewing. 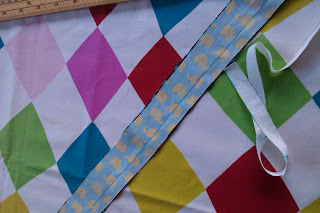 Then did a check to make sure it was matching, it did!, so I decided I'd sew the other two side seams, and that I could sew the whole thing along the bottom edge to make a sort of 'bag' to turn inside out, and leave no hem seams showing. They came out the same length, I felt quite pleased about that. The next job was to make the waistband. 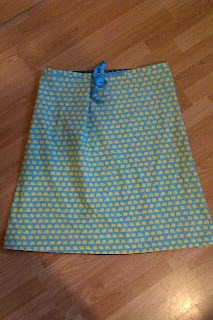 I made two strips - one of each fabric - sewed along the long edge, pressed it flat, pressed it over, made a small hem and sewed it to the skirt. A fudge, but a pretty one! I wore it at a festival last week, and it's comfortable and fits me. Which is pretty good going for a first attempt. But now the UK is plunged once more beneath the jet stream of doom, summer already apparently over, I'm going back to my knitting for a bit.